London South Bank University (LSBU) hosted a one-day event with Knowledge London and Kingston University on how academics can commercialise their knowledge and expertise. Practitioners from a range of academic institutions and private firms shared their insights and experiences relating to knowledge transfer, intellectual property (IP), models of enterprise, and working with researchers in national and international contexts. Speakers presented from Imperial College London, University College London, PaxisUnico and Marks & Clerk LLP. LSBU IP Manager Syeda Rahimunnessa presented on LSBU's IP policy and commercialisation best practice. Her presentation focused on what changes LSBU has adopted to enable academics to commercialise their ideas. She also proposed new ideas for supporting commercialisation that could improve policies and practices. "The event was a great way for academics and HE institutions to share their experiences and best practice of commercialisation. It was interesting finding out how different institutions approach commercialisation, and some of the common experiences and problems that are encountered," said Syeda. The programme also featured a panel discussion where academics shared their personal experiences of commercialising their knowledge and what convinced them to get involved. The panel included Dr Chris Brock, Senior Lecturer in LSBU's School of Applied Sciences. "In the School of Applied Sciences, commercialisation helps us to be role models for our students by showing them that we can do what we teach. It also gives us the opportunity to make an even greater impact with our research and expertise," said Chris. "Delegates from the event have fed back positively on the insight they gained into various aspects of commercialisation and the large scope of topics covered in the day. LSBU has been fantastic in supporting this event, from helping with speakers and promoting the event to providing efficient events support on the day," commented Sally Durrant, Entrepreneurship Project Officer at Kingston University. 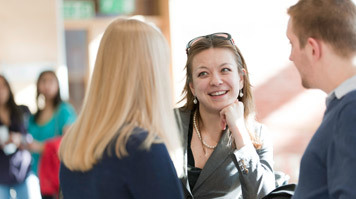 Research, Enterprise and Innovation at LSBU offers support and opportunities for academics and staff who want to commercialise their knowledge or get involved in a Knowledge Transfer Partnership. For more information on commercialisation and IP, contact Syeda at syedara@lsbu.ac.uk.